Tech Week: Sony's Cyber Woes, And A Coating To Ease Ketchup's Flow : All Tech Considered In our weekly roundup of tech headlines, we get you up-to-date on Sony's troubles after North Korea targeted its film The Interview, and tell you a community organizer's advice for tech companies. 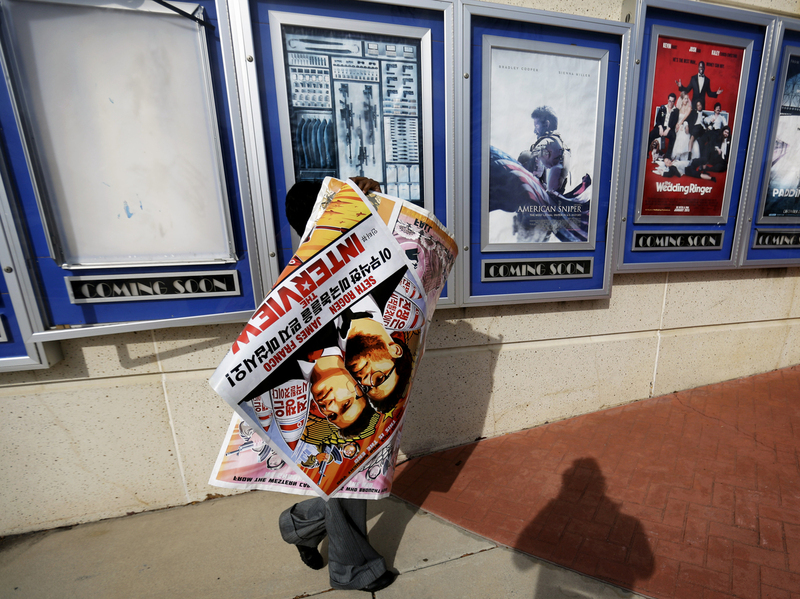 A poster for the movie "The Interview" is carried away Dec. 17 by a worker after being pulled from a display case at a Carmike Cinemas movie theater in Atlanta. The theater chain was the first to announce it would drop the movie; as others followed suit, Sony Pictures decided not to release the film at all. The big story in tech this week was Sony's continuing cyber troubles following the hack of its computer network late last month. The FBI formally accused North Korea of the cyberattack Friday. Also this week, we look at a new nonstick coating that helps condiments easily slide out of the bottle, and how the power of community organizing might be the key to tech companies' success. Say Goodbye To Ketchup Struggles: Our Weekly Innovation pick this week is LiquiGlide, a nonstick coating that for lining the inside of bottles to help ketchup, lotion and other products slide out more easily. No more shaking and squeezing — just tilt and let gravity do its thing. Organization Is Key To Successful Tech: Guest writer Catherine Bracy, director of community organizing at Code for America, brings us this story on why tech companies must focus on human resources and grassroots organizing in order to be successful. Sony Pictures still is reeling from a recent cyberattack that forced the company to pull its film The Interview, a comedy that cost $44 million to make, from the box office this week. The FBI confirmed Friday that North Korea was behind the attack, concluding that the malware used in the hack was similar to software used by North Korea in the past. In his end-of-year news conference Friday, President Obama called Sony's decision to pull The Interview "a mistake" and said he "wished they would have spoken to me first." The company's CEO, Michael Lytton, told All Things Considered that theaters forced the company's hand by deciding not to show the film, but that the film may not be shelved forever. "It is very important and we would very much like the American public to see this movie," he said. The group calling itself Guardians of Peace claimed credit for hacking Sony's computer system last month and released its internal documents, which included films, scripts, employees' personal information, and email correspondence between top studio executives — some of it deeply embarrassing to the company. "A hackers group called Guardians of Peace, in a statement on Tuesday, warned theaters against screening the film. "The Department of Homeland Security, however, has said that it does not perceive a credible threat." CNN reported Friday that the hackers behind the attack issued another statement saying that Sony's decision to pull the movie was "very wise," but also that the company needed to ensure that the film didn't reach the public through other channels.